An extension for Team Explorer to provide source control integration for Git. Enables integration with local Git repositories and provides tools to work with remote repositories. 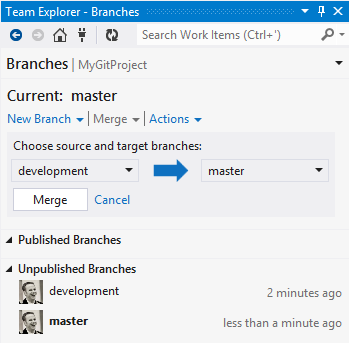 The Visual Studio Tools for Git is an extension for Team Explorer that provides source control integration for Git. This extension enables integration with any local Git repository, and it provides tools to work with third party hosted Git repositories. The extension also enables the use of Team Foundation Service hosted Git projects. 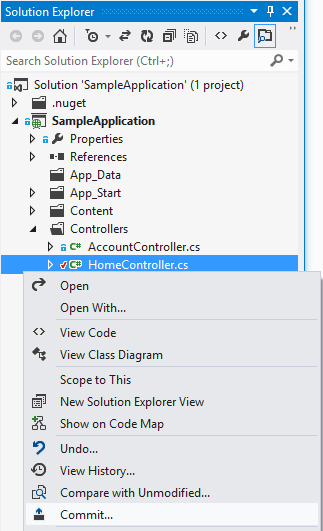 Integrates with Visual Studio projects to automatically track changes to your active solution. Shows file status in Solution Explorer, and uses context menus to issue source control commands like Commit, Compare, and Undo. 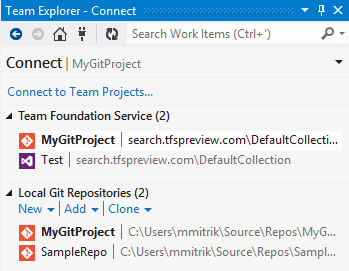 View local Git repos as well as those hosted by Team Foundation Service and other Git hosters via the Connect page. Track local changes and commit them using the Changes page. 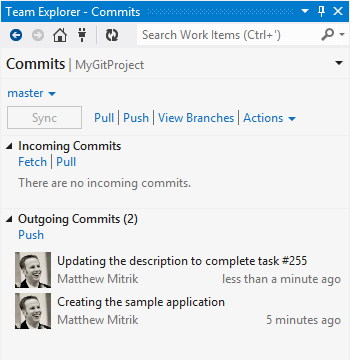 Manage incoming and outgoing commits with fetch, pull, and push operations on the Commits page. Create, merge, and publish branches on the Branches page. Signing in via Git provider after clearing cookies no longer fails with “Error: window.external.notifyToken is not registered"
Previously, a bug in libgit2 incorrectly set "tagopt = --tags" in the local gitconfig when cloning repositories. This bug is fixed in this release, and if a repo with this option set is opened in VS, a prompt to remove the option will be shown. If you are working against a Git repository hosted in Team Foundation Service, it is possible to see the following error in the "Sign in" dialog when first authenticating: "To help protect your security, your web browser blocked this site from downloading files to your computer. Click here for options…". This message is benign and can be dismissed by clicking the "X" in the message. Submodule support from the libgit2 project has arrived in this release, but we haven't yet finished all the work in our VS plug-in to make them work smoothly. Updated the installer to an MSI to better handle dependency checks during upgrade/install. As a result, this update requires the Visual Studio Update 2 CTP4 release to be installed. Added a new Resolve Conflicts page that can be used to resolve different types of merge conflicts. Rename conflicts are not yet supported in this experience and need to be resolved from the command line. There is a bug in libgit2 that can cause stale data to accumulate in the Resolved section of the new Resolve Conflicts page. Stale data can be cleared by switching branches from the command line. When connecting to a TFS Git project, the Changes page will list the current branch as "unknown" until the repo has been cloned locally. Viewing the Commits page for a TFS Git project shows the branch as "unknown". Attempting to publish to a URL is not a valid action and should be disabled. Trying to push may result in an error. Renaming files in Solution Explorer will display as an Add + Delete in the Changes view and Commit details. History for files does not yet follow renames. Conflict resolution does not yet support resolving merge conflicts that involve renamed files. Use command line tools to resolve these conflicts. 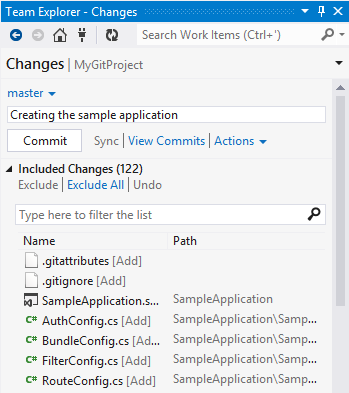 The Visual Studio Tools for Git optionally makes use of theGravatar image service. In the Git Settings page, if you choose to "Enable download of author images from 3rd party source", this will enable the use of the Gravatar image service. In order to provide author images in the Commit and History views, the tool creates an MD5 hash for the author email addresses stored in the active repository. This hash is then sent to Gravatar to find a matching hash value for users that have previously signed up for the service. If a match is found, the user image will be retrieved from the service and displayed in Visual Studio. Users that have not configured the service will return a randomly generated image. Note, email addresses are not recorded by Microsoft, nor are they every shared with Gravatar or any other third party.